This Course describes the complex nature of staff counselling. It provides an update on strategies to establish an effective counselling relationship. All health professionals involved in counselling staff in all areas of professional practice. 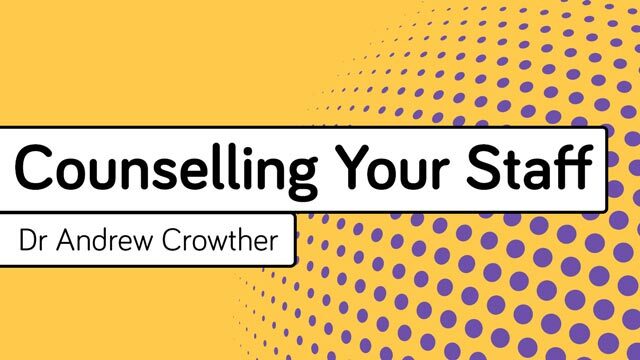 Explore what staff counselling is, and is not, and assist in the acquisition and enhancement of skills as a counsellor of members of their team. When a health professional spends time in a counselling relationship with a staff member, something in the life of that staff member will change – that person’s ability to explore, cope and solve problems will be enhanced or diminished. It is, therefore, paramount that counselling staff is undertaken appropriately since it can have a profound impact on the employer-employee relationship. Moreover, counselling staff is often confused with disciplinary procedures, performance appraisals or a pleasant chat between friends rather than a structured attempt to provide help in a problem situation. Health professionals involved in counselling staff, therefore, must be uniquely aware of the nature and process of the counselling relationship to maximise efficacy. Dr Andrew Crowther is adjunct associate professor in nursing and the former associate head of the School of Nursing, Midwifery and Indigenous Health at Charles Sturt University. His postgraduate studio includes education, state policy and social change, and mental hospital administration. Andrew qualified in general and psychiatric nursing in the UK. His postgraduate studies include policy and social change and historical aspects of mental hospital management. Andrew has wide experience in clinical nursing, nurse management, and education. He is the author of a book for nurse managers, as well as several texts and book chapters on a variety of topics. I found this lecture helpful and interesting. An important resource for all nurses and managers. This was a limited but helpful overview of staff counselling, raising and reinforcing valid points to consider improving the relationship and outcomes from staff issues. Hopefully I will be able to put what I have learnt to be a effective counsellor. This was very engaging. I learnt some new skills and have gained more confidence as I realise that I already use many skills discussed in this learning activity.